Can Calphalon Pots Go in the Oven? Calphalon provides various lines of professional cookware -- such as non-stick and anodized -- that include cooking pots. The cookware proves versatile because it can go from stove top to oven safely. While all of the Calphalon lines are oven-safe, some types have temperature or setting restrictions that you should be aware of to avoid possible damage to your cookware. 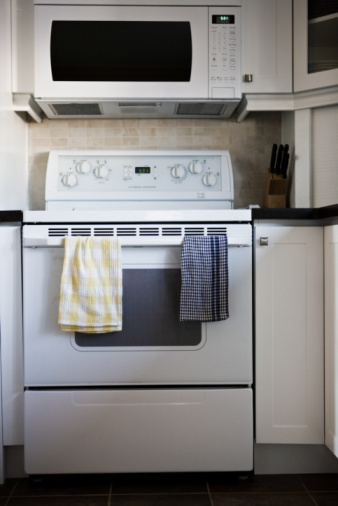 While oven settings up to 450 degrees Fahrenheit or more are safe for many types of Calphalon pots, more than one type is not safe to use when you have your oven on a broil setting. Any of the Calphalon cookware, including pots, labeled non-stick is not broiler safe. The Calphalon enamel cast iron cookware line is not broiler safe either. The broil setting can damage the non-stick surface of the pan. Any of the Calphalon pots that are labeled non-stick should not be placed in an oven of more than 450 degrees Fahrenheit. Calphalon stainless steel pots, without the glass-tempered lid, can be exposed to oven temperatures up to 450 degrees Fahrenheit. All of the anodized cookware -- except for non-stick anodized -- can withstand any oven temperature. Enamel cast iron cookware can also be placed into an oven of any temperature. Calphalon pots with glass-tempered lids intact should not be exposed to temperatures exceeding 450 degrees Fahrenheit or to the broiler. Depending on the type of pot you are using, you may be able to remove the glass-tempered lid and expose the pot to temperatures exceeding 450 degrees Fahrenheit or place it in an oven on a broil setting. Anodized pots with a non-stick label should be treated as non-stick not anodized. Handles on Calphalon cooking pots can become hot when exposed to oven or broiler temperatures. Use caution when removing pots from the oven by placing heat-safe pads or mitts over the handles. Never wash Calphalon cookware after heating until it has completely cooled. The cookware can warp and become irreparable.